Greensboro-based personal injury firm Ward Black Law is currently reviewing Actos cases that may be linked to bladder cancer. The Food and Drug Administration (FDA) has issued a warning that Actos may be linked to bladder cancer. 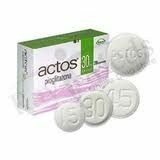 Actos is a drug for patients living with type 2 diabetes, although it can also work to balance good and bad levels of cholesterol as well. When used in conjunction with proper diet and frequent exercise, Actos can effectively reduce the level of glucose (sugar) in your bloodstream. The manufacturer of the Actos, Takeda Pharmaceuticals, continues to stand by its product, but it has agreed to include the possible bladder cancer risk on Actos bottle labels. At present, Takeda is sponsoring a study which will specifically access the risk of bladder cancer due to frequent Actos use. Ward Black Law is currently investigating the link between Actos and bladder cancer, and wiill continue to provide updates in this section of the website as more information comes available. If you feel you need to speak to one of our Actos attorneys, please contact our office toll-free at 877.256.1214. Actos statement 2: Actos “is available in three different dose levels,” and the one that you take depends on your specific case of diabetes. Ward Black Law is a Greensboro-based personal injury firm that is currently investigating potential Actos-related complications, such as bladder cancer. Contact one of the North Carolina Actos attorneys at Ward Black Law if you have questions your experience with Actos. Call 877.256.1214 or email us for help.